Motif partners with businesses to help them learn about their customers. These companies choose something specific they want to learn, from a very specific group of people. A study is specific project one of Motif's partners creates to learn from you! A title E.g. 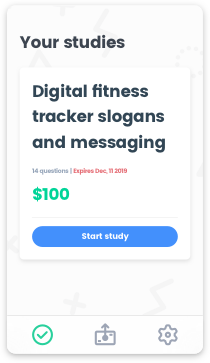 "Digital fitness tracker slogans"
Any studies that have currently started, or qualify for, are found on the studies dashboard. Inside of a study, you'll find all of the associated questions for that study. You'll never see more than 20 questions inside of a study.